Katrina Caton has been performing professionally since 1983 throughout New South Wales, Victoria and more recently South Australia. She started as a bass player in rock bands in NSW and then had a gradual transition to singing. During her career she has played support gigs for many touring bands and has sung in a variety of musical ensembles from solo, duo, trio, four piece, five piece six piece bands etc through to a 55 piece band. Katrina has performed in many local bands including “Miss Behaving” and “The Flaming Sambuccas”. Katrina performs three to four times weekly around Adelaide, South Australia. She sings with three duos and is a member of the Navy Reserve as lead vocalist in the band (a role which she has held for eight years). The majority of her gigs, however, are as a solo artist, playing electric & acoustic guitar accompanied by sequenced backing. Katrina owns and operates a state of the art professional sound system that can cover most venues & audience sizes. Katrina is endorsed by the Australian agency for Audix Microphones. Lighting can also be provided as part of a performance. Some of the regular current residencies where Katrina performs include The Novotel on Hindley Street, The Seacliff Hotel, The Semaphore Palais, The Sailmaster Tavern, The Adelaide Skycity Casino. Katrina has an unbelievable enthusiasm for performing & genuinely has a good time on stage. She instantly builds a rapport with any audience through her easy going relaxed, humorous, professional manner. Anyone watching her play is quick to recognize the enjoyment she receives from singing. This enjoyment is infectious. Katrina has sung on commercial jingles, performed at many high profile corporate events and released two CD’s of original music receiving national airplay. During 1999 Katrina received a grant from Arts SA which enabled her to release her first solo CD of original music entitled “Cross That Line”. In 2000, “Short Term Love” (from the CD) received national airplay on the Austereo network as a finalist in the “Unsigned Artist Competition” as voted by the listening audience. In Sept 2002 Katrina performed “Every night” (also from the CD) live to air on ABC Classic Fm to a listening audience of over 360,000 from the Newcastle Conservatorium backed by the 55 piece Naval Band of Australia. Katrina can provide ambient easy listening background music or pumped up energetic dance music. Katrina has an extensive repertoire of well over 200 hundred songs, and the list is continually growing. Styles include jazz, rock & roll, soul, motown, funk, blues, gospel, country, disco, dance, pop & musical theatre. 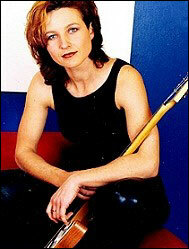 Katrina, however, is known mainly for her contemporary rock & pop repertoire.